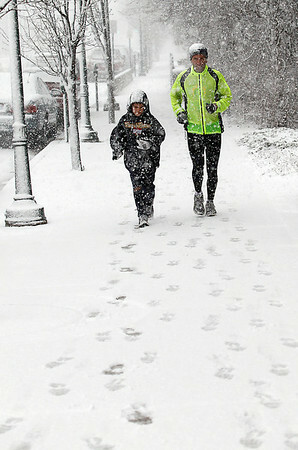 Matt Johnston, right and his son Ryan, 10, run down Cass Street in the snow Tuesday afternoon. The two are part of the Run For God class at Central United Methodist Church, which is training for a 5K race in Cadillac on Memorial Day. "When we left, there wasn't even any snow on the ground," said Emily Taphouse, another runner in the group.